Did you hear? Lincoln-King Academy will expand to serve grades 6-9 beginning in the fall of 2019. This expansion means we’ll be able to welcome more students to the Cornerstone family. This $6M expansion includes the addition of a new building as part of the Lincoln-King Academy campus. 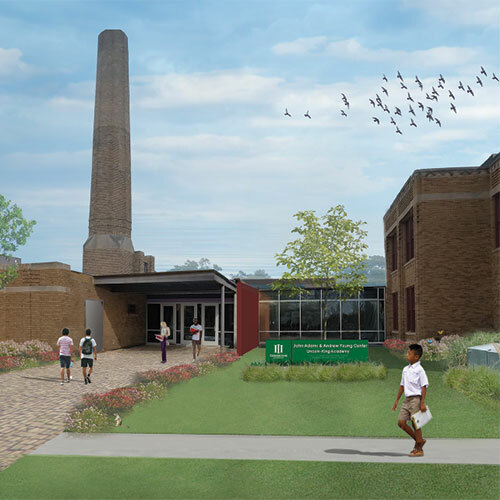 Students in grades K-5 will be served at a newly-renovated facility, the Lincoln-King John Adams & Andrew Young Center, located just east of the current campus. The new building is expected to be completed in the spring. 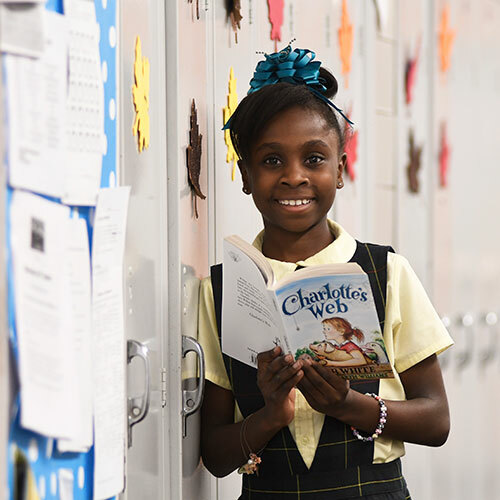 There are just a few days left in our Good 2 Read campaign, raising $70,000 to put a brand new book into all of Cornerstone’s 3,500 students’ hands, and an additional 3,500 books into our schools. Every $20 donation provides two books for this campaign. We still have a long way to go to reach our goal. 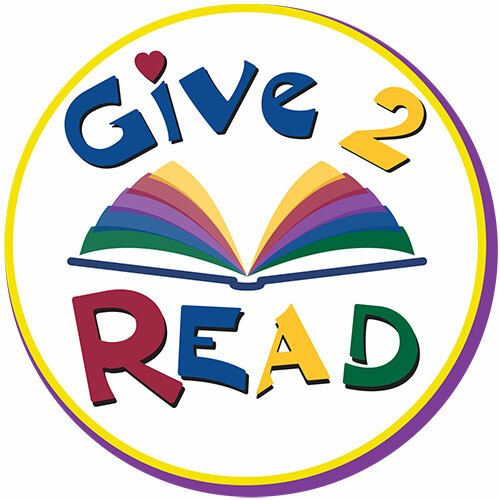 Click the link below to make your donation today, and be sure to spread the word so that together, we can Give 2 Read! If you spend any time at Washington-Parks Academy, you probably know Holli and Marlin Franklin. 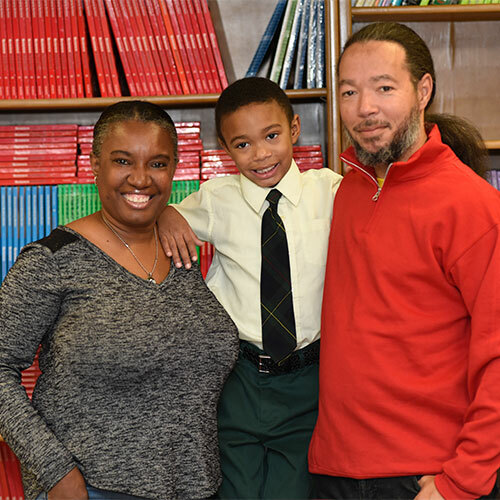 They’re leaders in parent organizations, volunteers for nearly every school function, and big supporters of the Washington-Parks Academy teachers and staff. 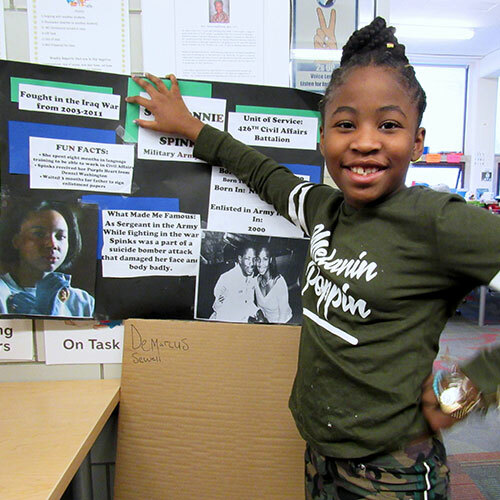 Our Madison-Carver students took on a BIG project for Black History Month, researching African-American heroes, then presenting highlights of their chosen character to an audience of parents and guests. 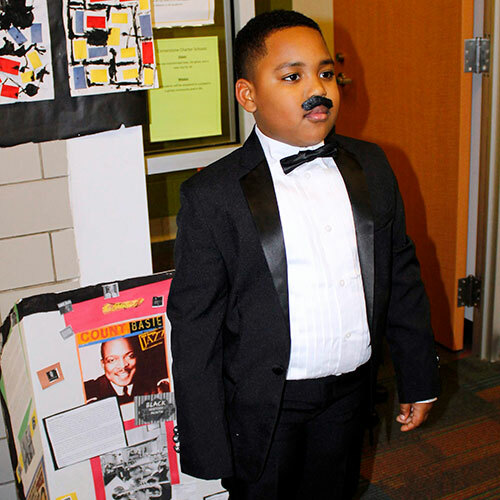 These students did a stellar job of representing black leaders, including Jane Metzeliger, Count Basie, Dr. Alexa Canady, Barack Obama, Russell Simmons, Oprah Winfrey, and more. We’re so proud of Cornerstone Health + Technology High School student, Aaliyah C.! She won a $25,000 award in the Detroit Pistons Black History Month Scholarship competition. 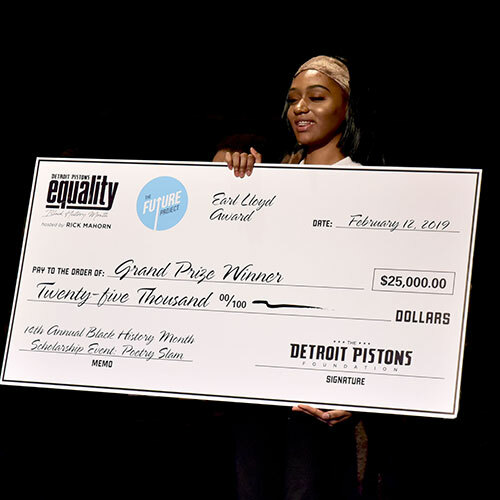 She performed her own spoken word piece, based on this year’s theme, “I Dream Detroit,” in front of a panel of judges and an audience earlier this month. Why is art such an important part of the Cornerstone curriculum? For starters, research shows that classroom art instruction has a positive impact on both behavior and academic performance. 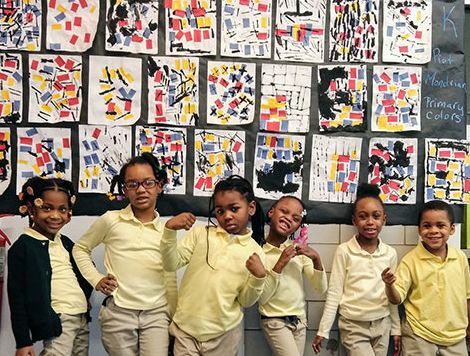 Last month, these kindergarten students from Mrs. Perdue-Daniel’s class at Madison-Carver Academy learned about primary colors by creating their own versions of the work of Pop Artist Piet Mondrian. “Students learn so much through art, like creative problem solving,” said Madison-Carver Academy art teacher, Christa Perdue. “Projects like this one teach children how to work through their mistakes.” It also expands creativity and imagination. Read the article at the link below to find out more about why art is a critical part of school curricula. Cornerstone Chess Team Going to Nationals! 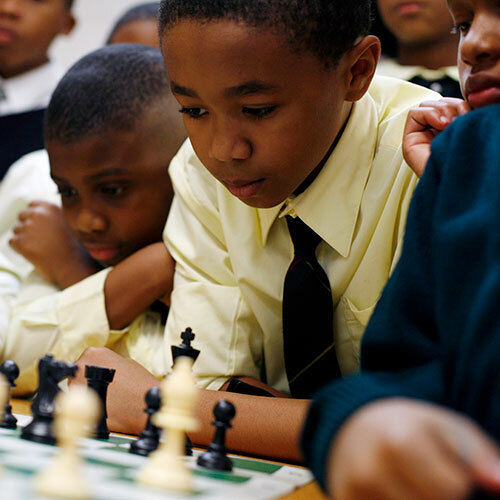 After months of hard work, perseverance, and team building, students from Cornerstone Jefferson-Douglass Academy’s chess team are on their way to nationals! Twenty-three students and three coaches are headed to either Middle School Nationals in Dallas in April, or the Elementary Nationals in Nashville in May. You can help us send our students to their national tournaments with a generous donation to cover travel, hotel, and tournament entry fees. Our fundraising goal is $26,106 to supplement the funds raised by chess team parents throughout the season. Please help our students build on their successes at the national level! March means Market Day at Cornerstone Health + Technology High School! 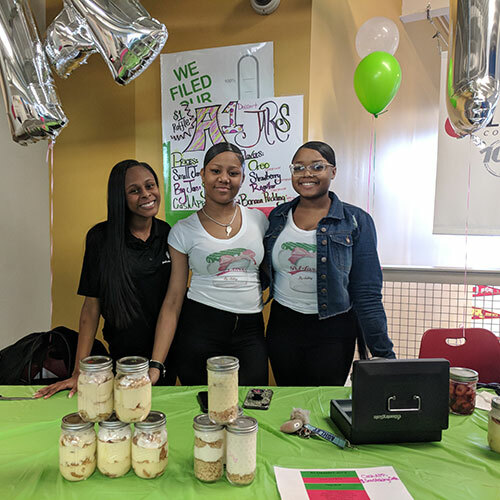 The Youth Entrepreneurs (YE) program, run by Mrs. Renate Matthews, teaches students how to run their own business, including planning, preparing financials, requesting a loan, and creating and selling a product. 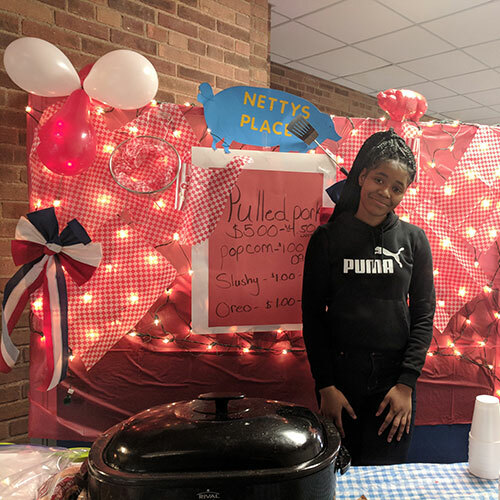 Many students chose food-based products to sell to fellow students and guests – including pulled pork, banana pudding, smoothies, cheesecake in a jar and several other delicious offerings. YUM! 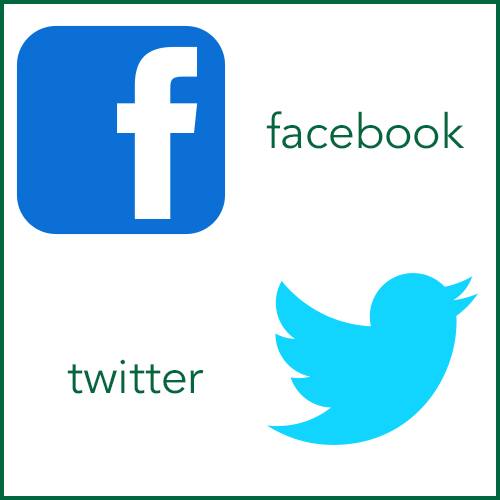 , to receive valuable information about Cornerstone Schools and education.